Hi Bonnie, sorry I didn't get back to you sooner. We just loved the pictures. We don't even know how to choose. We can't even imagine more. You are just so Awesome!!! Would it be possible to get them all on a cd? They are just priceless memories to us and would hate not to have them all. I hate to give Bonnie a recommendation because then she'll be busier and not have enough time for my projects... But to be fair here's why I've dubbed her the "Video Surgeon." After the event or post-production is just as important as the shoot... Careers are made and broken on the "cutting room floor." Bonnie took an overwhelming amount of video (from five cameras) and assembled them into a compelling story that went beyond my imagination. Now, I have a documentary length video! Well, I couldn't stop there! I asked if we could excerpt some video shorts (for today's shorter-attention spans on YouTube) and and she accepted. She has so much pride in giving her customers a superb and memorable video that she hesitates to ask for more money. I paid her more because it's important to build relationships with people these days who have pride in producing quality work. Bonnie Keith = Video Surgeon who exceeds expectations! Bonnie undersells and over-delivers. In other words, you'll get more than you'll pay for much less know to ask for. Too bad G+ doesn't offer more stars. Randy Keith has recommended your work as Owner/Operator Full Video Production Services at VideoMagic Productions. Details of the Recommendation: "To describe Bonnie's work as phenomenal would be an understatement. I have seen her work, from acting to directing, creating to producing, since nearly the moment I was born. Bonnie's passion for the camera and the subjects in front of it is unparalleled in her industry. She has the unique ability to take "the Average Joe" and make him/her a star on camera. She always delivers more than her "cost" and takes pride in every second of her work.". Omg that was beautiful I love it! Thank you Bonnie you captured their special day perfectly! I love this video u are the best!!! A.C. wrote: It's amazing. We Love It. ( Thank you Bonnie. I know you did a fantastic job, I can tell by how much passion you have towards your work. .Brandi A. March 2,2014 Bonnie did our wedding video this past December and it was absolutely amazing. She really worked with us so we understood the importance of having a video and was very communicative through the whole process. The experience and the video couldn't have turned out better and we highly recommend her professional services! I have no words to thank you enough for the beautiful montage you put together for our family! I am so grateful you are in my life. You are one of a kind! This is priceless. We can't thank you enough for putting it together and for all your hard work. It is a beautiful montage. Thank you! Thank you! Thank you! Bonnie goes above and beyond. Her work and professionalism is superb. I love working events with her, I'm a DJ. Bonnie not only captures so many priceless moments using various camera people in different locations, so nothing is missed... She also does it seamlessly working with me the caterer and the photographer, so that the party runs smoothly and the FUN and tender moments happen naturally! Bonnie is sweet and powerhouse of energy to work with and the final edited product is always timely and AMAZING!! Hire Video Magic for any and all your lifetime events!! Great job, oh lovely Bonnie. I'm SO impressed with your work! Who would've thought that you'd be on the other side of the camera? Thank you for your hours of work, your excellent eye, and your still youthful good looks. How do you do it? I am SO impressed with Video Magic and the wonderfully talented Bonnie Keith! If you are looking for a great sports video, wedding video and any other special occasion, you will get the best with Bonnie!! She is so invested in your project and has touched my heart deeply with the way she captured my daughter in softball! Thank you so very much!! Bonnie was referred to my family by our track coach for the taping of a sports video for recruiting purposes. From day one our experience with Bonnie was above and beyond what we were looking for. 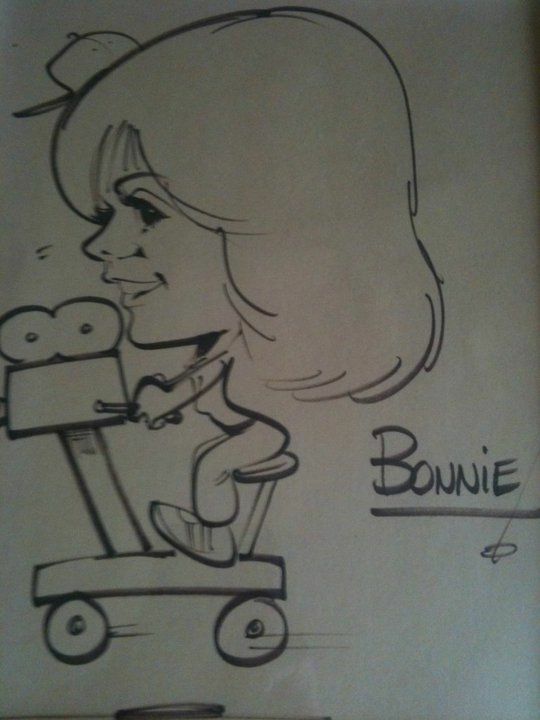 Bonnie was truly a pleasure to work with always professional and very accommodating. Bonnie's expertise was evident in her recommendations during production. We were very pleased with the finished product and we look forward to working with Bonnie and Video Magic Productions on future projects. Carolyn H. Can't wait for my copy to arrive! Know I'm going to love it! we just now watched this ?amazing!!! James loved it too?we even love the music you chose!! ----IT?S EXCELLENT!!!!!!!!!!!! you are soooo awesome! Kathy R. -Photographer.. 3/1/2013 Kathy R.
Bonnie puts her all into creating a video spot that speaks for you. I needed a video of a photography project in the making and she came through with flying colors for me. I told her what my hope was and she made it happen exactly so that the video captured the day just as it unfolded. I am a fine art portrait photographer and being taped while photographing in my small studio was a challenge. The disk was delivered quickly so I could share the experience right away with my audience as well. I wholeheartedly recommend Bonnie for a one minute (or longer) commercial about your business or any other video work you need. She is very professional. It has been a pleasure to not only work with Bonnie but to also get to know her. She is a wonderful individual and makes beautiful videos that will capture and convey any emotion you tell her you are hoping to express with your video marketing. I feel she went beyond what anyone else would have done for me in the editing of my video. She was patient, responsive, and willing to try different things to see what would work for me. She never made me feel like she was "done" with me, or needed me to hurry and make a decision so that she could finish the project. I love her work as much as I love working with her. Thank you Bonnie!!!! I sent Bonnie several hours of home movies that were previously transferred onto DVD. The problem was they were all mashed together -- different people -- different times on assorted DVD's. Bonnie was able to edit the movies onto four separate DVD's that had all the right people in the right movies at the right time. She added titles, special effects, and the most perfect music I could imagine. I sent her a mish mash and she sent me back a masterpiece. Her rates are great and her professionalism is unparalleled. Bonnie the owner of Video Magic Productions, truly works Magic! She is professional and knows her stuff. She recently filmed live interviews with other professionals for a campaign that I am doing and I was so impressed with her knowledge and her willingness to make things look and feel great! The program that she helped get me signed on to- Talk Fusion has also helped my business grow. I am very appreciative to Video Magic Productions for all that they continue to do to help me grow my business and stay , CUTTING EDGE! 5 STARS from me !1 Will refer to all I know! Bonnie is a magician when it comes to video. She is a true artist and makes you feel like a star in your own picture show. The consummate professional Bonnie strives to make sure you are comfortable and at ease during your video shoot. You will appear as though you had been in front of the camera for years even if it is your first time. Most of all she captures you in such a way that people really get a sense of you which is what it is all about. Bonnie videotaped an entire Laughter Yoga presentation of mine and then edited it into a much smaller version that I could post in other places. It has been so encouraging to people who have seen it. One friend from across the country saw it and immediately googled Laughter Yoga in her community so she could participate! Bonnie also has amazing ideas about how you can use your video to market your business. Just a wealth of information and heart! Bonnie makes you feel at ease in front of the camera. She is great with editing and music to make your video stand out. As a doctor, this is a great tool to help patients feel at ease and educate the procedures that I perform. Bonnie shoots for professionalism and makes you and your business look great. I love her lively energy. She is very quick to get the video reviewed for your approval before the final edit. I would recommend her and her service for any business. Bonnie, is an untapped resource. You should meet with her for a no fluff meeting about you video needs. She has done many videos in the Santa Clarita Valley. cost effective and on time. I'm not the kind of person that would ever consider being on camera. But yet Bonnie was able to coach me into doing a Video of me and my Business. Its not easy for some of use to be on camera.Her understanding and patients made it easy.With fantastic results. I guess that why they call it Video Magic. Bonnie created some great short videos for me to use for marketing. She is professional, very knowledgeable about her craft and the videos are great. I highly recommend her. Bonnie is a dynamic entrepreneur who not only knows the details of her business, but uses great savvy in administering it. Bonnie has done several videos for my floor covering business. She always does a great video and somehow helps ease my nerves while filming. I highly recommend Bonnie Keith. Bonnie Keith produced this video for Brenda Avadian on "The Five Minute Respite"